Ruggero Sintoni was born in Faenza (Ra) in 1955. Ruggero attended the Accademia Antoniana di Arte Drammatica in Bologna attaining his diploma in 1981 after a significant artistic experience with Julian Beck and Judith Malina’s Living Theatre. The following year, Ruggero co-founded Accademia Perduta of which is he president to this day. 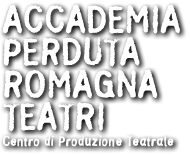 In 1993 and 1997, Ruggero designed and produced Teatri per la verità, a number of productions and festivals whose profits have been entirely donated to the Association for the victims of Ustica’ disaster. Ruggero’s commitment and dedication to this cause has been ongoing, firstly with a production for the 2000 Bologna Cultural Capital entitled I-tigi Canto per Ustica, with Marco Paolini and the Quartetto Vocale Giovanna Marini. In 2003, he founded, together with the Association Scenario and the Association for the Ustica disaster’ victims, the Premio Ustica per Il Teatro di impegno civile e sociale (Ustica Award for socially engaged theatre). He is currently also a jury member for administering this Award. In 1994/95, Ruggero attended the Master Course for “Gestione delle Attività Artistiche e Culturali” (Art and Culture Management) at the S.D.A-Università L.Bocconi in Milan and since 1998, he has lectured within many professional courses at the most prestigious Italian universities, amongst which D.A.M.S.in Bologna and Milan’s Bocconi. In 2004, AGIS in the Emilia-Romagna region voted Ruggero as President of the Associazione delle Imprese dello Spettacolo dal Vivo (Association of Live Theatre Establishments, from music to theatre and dance enterprises). Over the same year, Ruggero designed and produced, together with Alessandro Serena, an original form of outdoor circus and theatre art, specifically intended for cities squares. In these shows, international acrobats perform directly within the context of monuments and historic palaces. The project took place over two editions of La notte delle Creature (The Creatures Night), in Piazza del Popolo in Ravenna and with La compagnia di Icaro (Icarus Company), in Piazza Saffi in Forlì. In the summer of 2006 Ruggero produced and toured La Passione by Mario Luzi, with actors Lucia Vasini and Daniela Piccari, and director Velia Mantegazza, taking it to the most suggestive Pievi in Romagna (n.d.t. Pieve in Central and Northern Italy indicates a parish church generally in isolated country sites). In October 2006, Ruggero is nominated member of the National Executive of the A.N.T.A.C. (The AGIS National Association of Theatre Companies in Contemporary Art). In 2007 he created and produced Ultimo Volo-Orazione Civile per Ustica ( Last Flight- A civic oration for Ustica) in collaboration with the Associazione Parenti delle Vittime della strage di Ustica, with the Town of Bologna, the Provincial Government of Bologna, the Regione Emilia-Romagna Government and the Orchestra Sinfonica “A.Toscanini”. The performance, an opera of musical theatre by Pippo Pollina, made its debut at the Manzoni Theatre in Bologna on 27 June, in occasion of the 27th anniversary of the Ustica disaster. Since 2007, Ruggero began Il Circo della Pace (The Peace Circus) in collaboration with Alessandro Serena for the Town of Bagnacavallo. It is a project of extraordinary artistic, cultural and social significance, represented all through the Christmas celebrations in Piazza Libertà, in Bagnacavallo, involving the entire city. In May 2008, in occasion of the FAC, the Contemporary Art Festival in Faenza (RA), Ruggero produced the preview of Natività a Faenza, an architectural visual show, as a teaser to introduce a multimedial Nativity production screened on the façade of Faenza’ Masini Theatre during the 2008/2009 Christmas holidays. In 2009, Natività a Faenza was invited to DivinaMente New York, to the USA, for its second Spirituality Festival. For the prestigious Spoleto Festival 52nd, 53rd and 54th editions (2009, 2010, and 2011), Ruggero created an Anthological production of the most important creations of Accademia Perduta’s Theatre for Children and Young People. The production was performed all through the festivals programs. Together with Rosetta Film, Ruggero has coproduced two docufilms directed by Roberta Torre: I tiburtino terzo and La note quando è morto Pasolini, that both made their international debut at the 62d edition of the prestigious Locarno Festival in August 2009. In September 2009, Ruggero was re-elected President for “Spettacolo dal vivo” (for music, prose and dance) by AGIS Emilia Romagna region. In Decemebr 2009, he created and produced the “Teatro per I ragazzi“ Festival in occasion of Teatro San Leo’s inauguration in Pietracuta. In April 2010, Ruggero was nominated member of the Scientific Committe for the Alchimialchimie Festival in San Leo (RN). In October of the same year, he conceived and initiated the RETE DEI TEATRI DELLA VALMARECCHIA (Valmarecchia’s Theatre Network), together with the Town Councils of San Leo, Novafeltria, Pennabilli, Sant'Agata Feltria, Verucchio, funded by Provincia di Rimini and Regione E.R. governments. This innovative network experiment continues to protect and maintain the various theatre entities present on the territory, enriching them with the experience of Accademia Perduta / Romagna Teatri. In 2011, Ruggero created the 5th edition of Circo della Pace in Bagnacavallo, joining to the project Homeless Circo&Dintorni, the Polish Foundations Ocelot and the Hungarian State Circus. The project, presented to the CEE Commission, ranked 4th place over 561 applicants, with a score of 96/100. Therefore, the project was funded within the Programma Quadro dell’Unione Europea Cultura 2007/2013 (European Agenda for Culture, 2007/2013). In May 2012, Ruggero won the Town of Forlì’s triennial Call for Artistic Direction of the Diego Fabbri Theatre in Forlì. He shared this responsibility with Claudio Casadio, Lorenzo Bazzocchi (Masque Teatro) e Claudio Angelini (Città di Ebla). In the summer of 2012, Ruggero was the creator of “La Rotta del Sale” (The Salt Route), a special event in occasion of Milano Marittima Centenary celebrations. “La Rotta del Sale” proposed three days of visual shows and impressive light installations at the Cervia Darsena, providing a “frame” to the historical reanectment of the fleet departure to sail along the ancient salt routes from Cervia to Venice. In June 2013, Ruggero cofounded Assoteatro, an association for the promotion of live theatre with a civic agenda, for freedom of artistic expression, for the propagation of theatre culture as irreplaceable social value in the interest of the community and for the common good. In Autumn 2013, Ruggero collaborated with Faenza’ Town Council for the restoration and reopening of the Masini Theatre’s Ridotto, organizing four weeks of inaugural events to “return” that prestigious space to the township (the events included various happenings in theatre, music, dance, video art, literature, fashion and guided tours). In April 2014, Ruggero lectured for the SDA Bocconi in Milan in the subject ““Le Istituzioni Culturali in Italia: assetti e gestione” (Cultural institutions in Italy, their assets and management) for the Italian Ministry for Culture in a course destined to the directors of main museum and theatre institutions of the Russian federation. In 2015, Ruggero collaborated with Hiroshi Sugimoto and the Foundation for Photography in Modena for the production and presentation of the Master’s new works on Italian theatres. The project took place at the theatres Goldoni in Bagnacavallo and Masini in Faenza. The same year, the Town of Santa Sofia entrusted Ruggero Sintoni with designing the Inaugural Season of the Mentore Theatre. For this occasion, Ruggero created and produced an inaugural show by the theatre workshop in the Forlì ExGil with a performance by Pamela Villoresi. In 2016, Sintoni created and curated Il cinema della verità, a docufilm festival screened at the Ridotto of the Masini Theatre in Faenza. The same year Sintoni received in Cervia the Award Romagna Festival in the Theatre section. Other personalities awarded by the Festival were Roberto Brunelli (Musei San Domenico) for Culture; Roberto Balzani (historian) for History; Roberto Cavallini (Il Ponte Vecchio) for Publishing. Ruggero Sintoni has since been confirmed Artistic Director of the Mentore Theatre in Santa Sofia (FC) and Artistic Co-director of Teatro Diego Fabbri in Forlì. In 2016, he was unanimously elected President of the National Association of Theatres for Contemporary Art (A.N.T.A.C./Agis). Since 2017, Ruggero is member of the jury for the International Festival of Documentary Cinema- Premio Marcellino De Baggis.